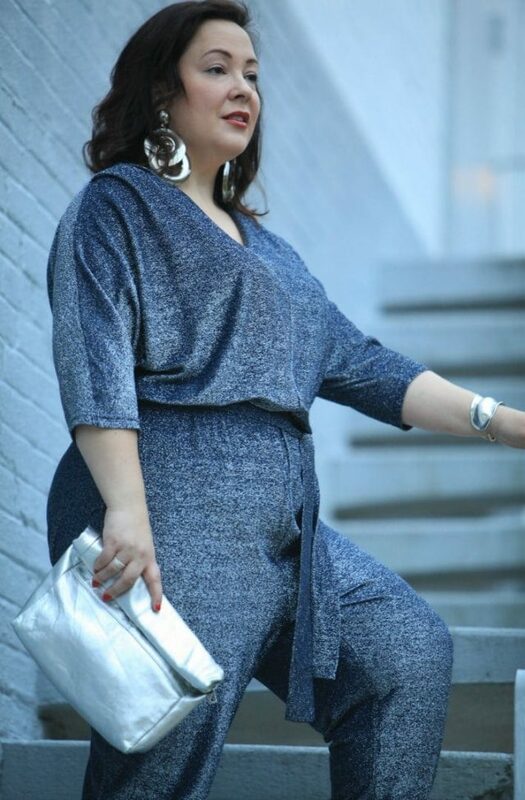 Earlier this year, I attended an event to celebrate the curvy community in the DC area. I knew it would be amazing fashion, and wanted to stand out but still remain comfortable. 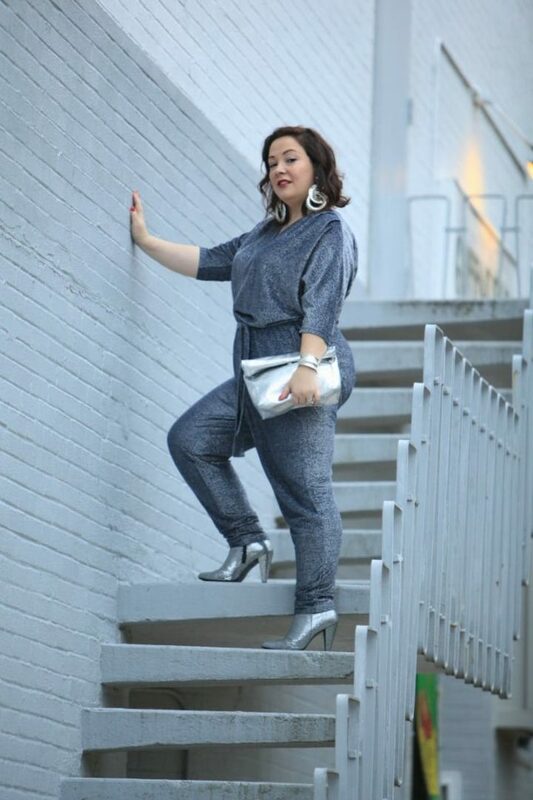 I really wanted a jumpsuit, and googled plus size sequin jumpsuit and found this one from Ellos. I was meeting with Ellos and Full Beauty Brands the next week for their fall campaign and reached out to see if they could provide it for the event. I received it when in NYC and had no time to get it altered for the event. I found I didn't need to! 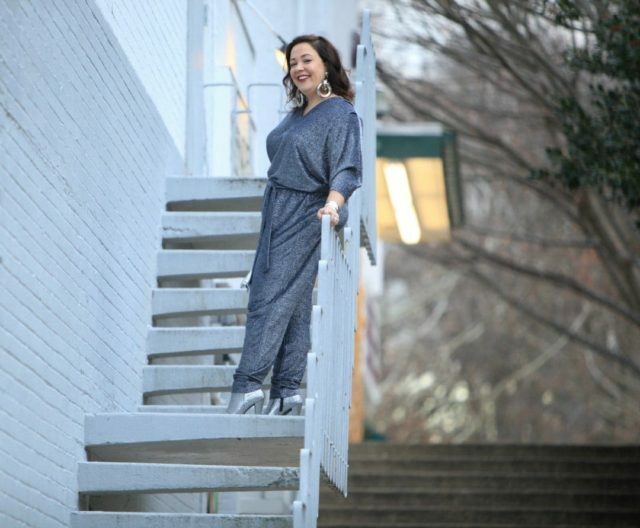 Being petite, the jumpsuit has more drape and a bit of a harem pant vibe. For taller women, the legs are not so drapey. I saw it on The Tall Society and it looked great even with cropped legs. I like the slouchy vibe of it mixed with the super sparkly stretchy fabric. It comes in two colors, it was hard to decide which to get but I dig the blue color. This is the kind of piece that can be transformed with accessories. Switch out the self belt for a silver metal plate one, or a sparkly rhinestone one for more glitz. A pair of heeled sandals will dress it up more, a pair of flats can dress it down. I wore it to the event with these same exact accessories. This is a great option for New Year's Eve as it's festive and fun yet you're warm and covered. Oh, and the zipper in the back isn't super low and the fabric is stretchy so it's easy to zip and unzip on your own! 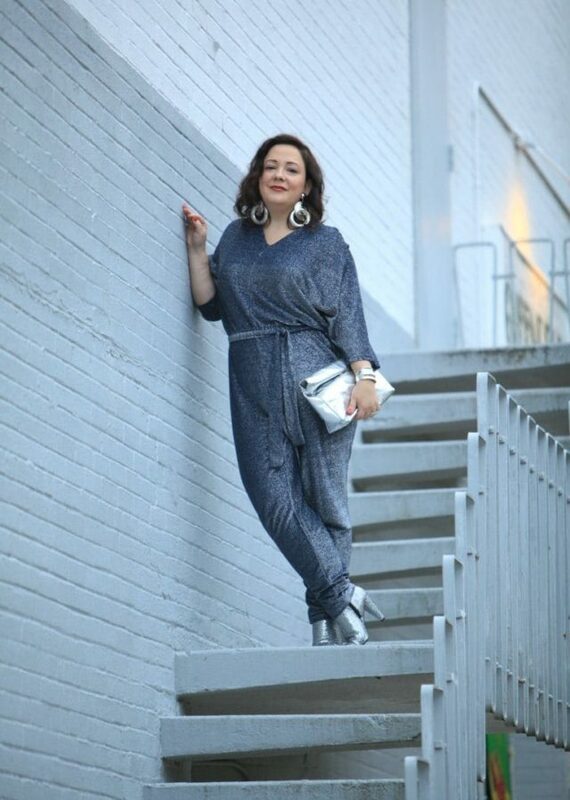 You are slammin’ in that jumpsuit! 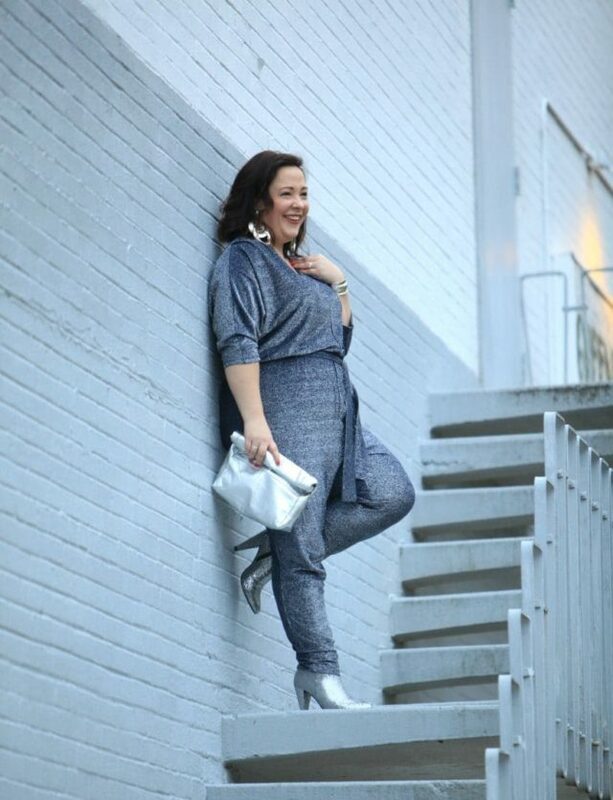 All the silver accessories complete the look and make the silver in your outfit pop! I love it! This is fantastic on you and I get a David Bowie vibe in the best possible way! Those earrings are also spectacular. I was feeling the Ziggy Stardust thing as well! As usual, this outfit looks better on you than the model. I think the design needs curves to show it off to advantage. On the model, it looks like a skydiver after a successful jump and landing carrying off her deflated parachute. How do I edit on your new commenting app? LOL! Well thank you Chris! Hi, not related to this particular post but in looking back to remind myself how Susan of Un Femme styled a leopard coat she bought last year from Velvet (Graham and Spencer) I saw you had commented on Insta about trying to buy the same coat but it was out-of-stock. I, too, also was desperate to get the Celine leopard coat which is now back in stock and I have one on its way! So thought I would let you know if that is on your “acquire” list now is the time! Thanks for all of the WO posts and advice you give religiously! Appreciate all of the effort and hard work. Wow thank you for the heads up you rock! Fabulous look on You. I so enjoy reading your blog and look forward to more. 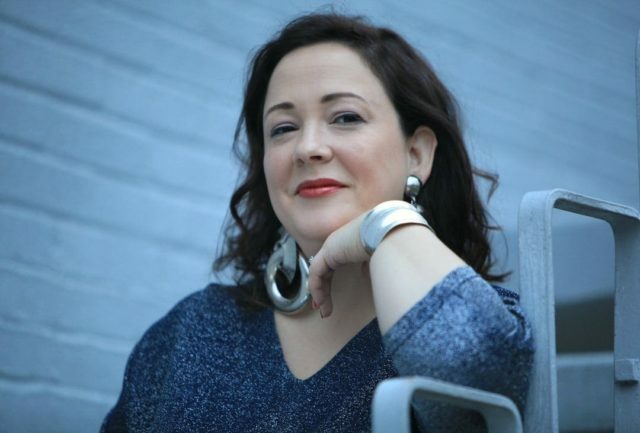 . .
You look fab and comfy and supremely confident in your own skin. You really do inspire me to step out of my comfort zone. In fact, recently, I ordered the Asos boiler suit based on a post from around Thanksgiving. I love it and am interested to see how you styled it. You teased that in your post and I’m looking forward to seeing you put your spin on it to dress it up. I wear it casually with a long sleeved tee underneath it and booties. I am totally going to shoot it this week! I wear it with silver booties and added some sequined patches on the back but love your idea! Dammit, I’ve got it in my bag. 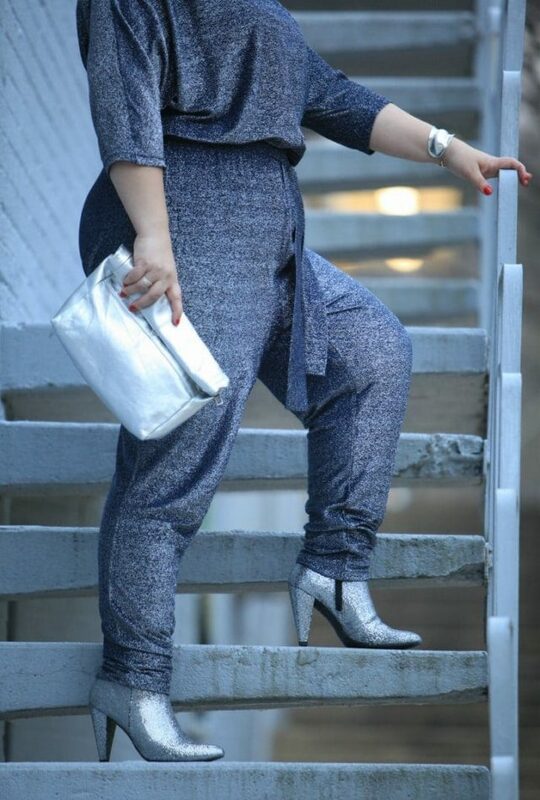 I love this sparkly jumpsuit. Loooove it. I can totally see you in it!